SugarMyBowl.com: Who Got Milk? I do! Who Got Milk? I do! I stay away from making any New Year resolution every year - partly because I don't like leading myself in to disappointments. But then, a great opportunity came along that fell along the lines of the "New Year, New Me" and didn't hesitate to happily say yes. And because good intentions are what New Year's resolutions are all about, so why not just go with it. So to kick off my 2014 I just signed on as the new Milk Mustache Blogger Spokesperson and I couldn't be more excited. The program is to learn and promote healthier beginning of our days with balanced protein intake for a day long success. Yes, easier said than done, of course. Because if you are anything like me, and I suspect like all moms are, the mornings are the craziest part of the day. As much as we'd like to take that extra few minutes to get ourselves ready, moms like me usually bolt out of our beds running to get our kids and ourselves ready for school and work. Often times for me, breakfast is composed of a quick cup of coffee from Starbucks and an oatmeal if I can carve out that extra minute. Not too bad for breakfast choices but I'm not sure if I am getting enough of the nutrition that my body really needs. Thankfully, the program also comes with some guidance from an assigned Registered Dietitian partner, Victoria Shanta Retelny (author of Healthy Healing Foods) who will help me figure out how I can meet the protein intake I should be getting. According to Victoria, I should be consuming about 60-65 grams of protein per day. I learned that protein makes you full faster and longer and it also offers my muscles good fuel and will keep my blood sugar stable. Just to give you an idea, a cup of milk has about 8 grams of protein so we looked into how I can start with incorporating a portion of that in my breakfast and the rest on all of my meals and snacks. To start me off, she has suggested the following ways to enjoy my milk for breakfast everyday. This is an easy enough guideline to follow so I never have to worry about disappointing myself on my new great intention of a healthier me this 2014 and beyond. I really appreciate the time I spent with Victoria and all the new things I am learning from her. She will continue to work with my progress and will be able to share my experience on this program for the next few weeks. So here's to the a healthier new year! I hope you will follow along for the next few weeks. 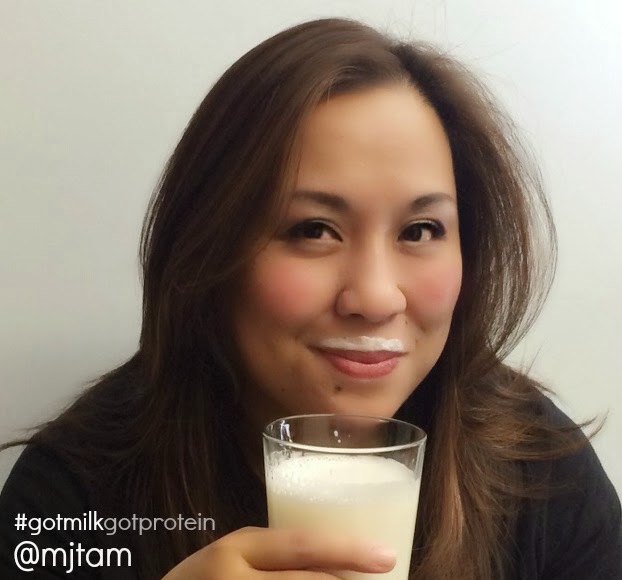 Disclosure: I’m a paid spokesperson compensated by The National Milk Mustache "got milk?" Campaign. My opinions are completely based on my own experience.